As debate grows over the extremism of some armed factions battling to overthrow Syrian President Bashar Assad’s regime, an incendiary illustration on the Facebook page of one such group leaves little doubt where its leaders envision the uprising ending – with masked Islamic fighters marching through Washington, D.C., as the U.S. Capitol burns in the background. Evan Kohlmann, a senior partner with the security firm Flashpoint Intelligence and an NBC consultant on terrorism, who discovered the image on Facebook and provided it to NBC News’ investigative unit, said Al-Aqsa has not been designated as a terrorist group by the United States. But he noted that it fights alongside another Free Syrian Army force, the Tawhid Brigade, that has been linked to Jabhat al-Nusra, one of two rebel factions labeled terrorist groups by the U.S. government. "As a group that claims affiliation to the generally pro-Western Free Syrian Army, it is difficult to reconcile the fact that it has plastered such a lurid anti-American image as the banner on its own official Facebook page," Kohlmann said. "It raises the unfortunate but inescapable fact that not every group within the Free Syrian Army is closely aligned with U.S. interests in the region." 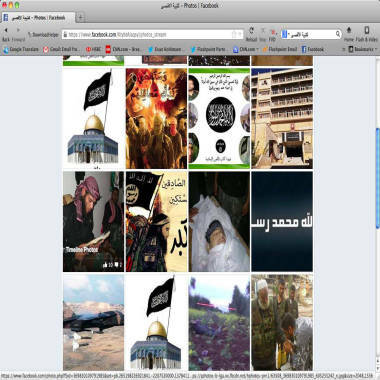 Gallery on the Al-Aqsa Islamic Brigades Facebook page includes photos featuring the black flag of al Qaeda in Iraq. Such murky alliances and rivalries within the Free Syrian Army help explain the skepticism that greeted U.S. Secretary of State John Kerry on Thursday when he told members of the House Foreign Affairs Committee that “bad guys” – Islamic extremists – constitute “maybe 15 to 25 percent” of the opposition forces. Several lawmakers questioned Kerry’s assertion and a senior military official told NBC News that actual percentage is “way higher than that.” Defense officials estimate that al Qaeda and related extremists groups now constitute “more than 50 percent” of the rebel force, which is made up of at least 70 different factions, “and it’s growing by the day,” according to the official, who spoke on condition of anonymity. The al-Aqsa Brigades ties to the al Qaeda-linked Jabhat al-Nusra were in the news earlier this year, when a former Army medic was indicted in March by the U.S. Attorney's office in Alexandria, Va. The indictment charged that Eric Harroun had fought with Jabhat al-Nusra, firing rocket-propelled grenades in combat. In his defense, Harroun's lawyer said that his client had actually fought with a splinter group of the al-Aqsa Brigades, not the terrorist group, and asked for bail. The judge declined and Harroun remains in federal custody in Arizona. In a video posted to YouTube earlier this year, Harroun expressed his support for the rebels. While details of the Al-Aqsa Islamic Brigades leadership and goals are unclear, Kohlmann said, the group makes no secret of its Islamist orientation and general antipathy for the West. He noted, that in late February, the group issued a report lambasting “the role of Western Crusader intelligence in the Syrian revolution." NBC News' Chief Pentagon Correspondent Jim Miklaszewski contributed to this report.